Exciting opportunity for a full time Sr. Clinical Informatics Business Relationship Manager! The Senior Clinical Informatics Business Relationship Manager is accountable to the Manager Clinical Informatics & Business Relationships and is dedicated to work as the strategic interface with clinical and business partners across the Health System with the purpose of business-I&T development, solution discovery, project management, service management, risk management and relationship management. The following responsibilities are a general description of the level and nature of the work required and is not to be considered all inclusive. The Senior Clinical Informatics Business Relationship Manager will serve as the strategic interface between clinical and business teams across the Healh System and I&T. This position functions as a strategic consultant, "trusted advisor" and key I&T advisor to all levels of personnel within Baystate Health in accordance with Baystate Health’s mission, vision, policies, procedures and standards. The role is responsible for designing systems to promote and advocate for overall clinical and business strategies. Acts as the internal expert in terms of what clinical and business applications are, and are not capable of, and is responsible for knowing what changes have been made to the applications. Responsibilities include: documenting functional and technical requirements, mapping process flows, documenting test plans, conducting system testing, documenting user manuals, identifying opportunities for operational excellence, issue resolution, monitoring I&T protfolio, manage project intake and exectuion tasks, monitor industry trends, and develop and administering training. May provide guidance and consult to other positions within the Team. Serves as an infrastructure role across Baystate Health and within a department; analyzing complex clinical operations and structure processes to facilitate decision making regarding clinical systems; utilizing the knowledge and skill of expert clinical practice to determine clinical functions that are suitable for computer applications; and ensuring information systems are consistent with professional practice standards. This position supports operational excellence and improved patient outcomes through expertise in clinical practice, structures, and technologies, thus helping the providers, clinicians and all members of the patient care team to create and record the evidence of their practice. The position is responsible for providing leadership and direction in planning and administration of I&T projects which impact all clinical and business departments. Functions in a key leadership role, in collaboration with leaders from multifunctional teams across Baystate Health, as an expert care provider and clinical systems authority. The role assists all members of the healthcare team to manage all aspects of project planning, design, development, implementation, maintenance, integration, training, communication and evaluation of informatics solutions. Develops and implements training pertaining to the staff use of informatics solutions. Participates as an active and integral member of the department and maintains the established standard of care and practice through knowledge and skill in expert patient care, clinical system improvement activities and staff education. Ensures Baystate Health is evaluating and selecting key emerging technologies which promotes improved healthcare delivery models coordinated with effective and efficient workflows to fit within the integrated systems. Project Management and Oversight: Provides project leadership for complex projects impacting all levels of the organization following project management methodology. Develops functional and technical specifications for application development initiatives – vendor based or internally developed systems by developing and maintaining project plans, project charters, status reports, issue management tools and scope management tools. Leads the design and documentation of workflow requirements. Coordinates and leads multidisciplinary teams to ensure the implementation is executed according to established project plans. Collaborates with I&T Project Management Office to ensure adherence to established and approved timelines. Evaluates project success by coordinating post-implementation evaluation and documenting if the solution successfully met the clients business objectives. Administration and Leadership: Assists in developing and executing the strategic vision for clinical and business partners across the Health System. Manages clincial and business leadership priorities and portfolio's of I&T requests and projects through thoughtful leadership and expert consultation on the design, development, testing, training, communication and implementation of informatics solutions. Decision/Clinical Support: Fosters a team environment. Responsible as a thought leader for maximizing technology design to achieve the best clinical and business outcomes, promoting optimal care that reduces errors and achieves organizational goals. Consultation: Expert in human factors, patient safety, and use of technology to optimize care delivery process and effectively communicate patient care activity. Assisting care providers to create and record the evidence of their practice within the Electronic Health record and other patient-care related technologies. Consultation: Collaborates and coordinates with key clinical and business partners to develop sound technical solutions and application changes to meet the demands of the team/service line. Mentors and provides guidance to other team members within Clinical Informatics, as well as all clinical and business partners across the Health System. Maintains awareness of organizational changes, strategic objectives and initiatives, acts as an advocate to ensure application requirements support the desired outcomes. Stays abreast of supported applications and current technologies, application, and vendor developments of supported applications and technologies. Ensures appropriate coverage for responsibilities during implementations. Reports and escalates progress, plans and issues, as appropriate. Participates and contributes in clinical and business leadership meetings as needed. System Maintenance and Support: Develops and maintains clinical and business relationships by ensuring timely and effective resolution of issues and communicates recommendations for system modifications and enhancements to the appropriate teams. Codes and maintains current software programs. Performs, monitors and reports on unit/system and functional testing. Education: Demonstrates and shares the benefits of continuous learning. Develops comprehensive functional and technical specifications for complex system projects and modifications. Escalates application issues to key clinical and business stakeholders as appropriate. Develops and administers clinical training plans in collaboration with clinical and business partners, Informatics Traning Team and others as appropriate. Minimum of 7 years progressive clinical experience in complex acute care hospital or ambulatory setting required, experience in advanced nursing practice and healthcare information system environment preferred; Additionally, five (5) years of Clinical Informatics experience providing a leadership role implementing and supporting health care clinical systems is required. Bachelor’s Degree in Health Care Field from an accrediated college/university with a state license and certification from either ANCC in Clinical Informatics or HIMSS Certified Professional in Healthcare Information and Management Systems required. Self-directed, takes initiative, innovative, responsible. Ability to maintain a professional attitude and demeanor at all times during normal and pressure situations, honest, flexible, analytical, problem solver, detail oriented, works well in a fast paced/multitasking environment and is compliant with the BH Operating Principles. Ability to interact with all levels of the organization contributing to a work environment of caring and cooperation among a culturally diverse workforce and patient population: superior customer service orientation, collaborative; team player; presentation and relationship-building skills, leads colleagues, successful change agent; negotiation and conflict management; works through issues in a professional manner. Understands hospital business operations, policies and procedures and clinical/ancillary workflow processes and applies knowledge of clinical practice trends and Information Systems to clinical and business service areas. Ability to assess, map and analyze real-life clinical an business practices to Informatics applications which represent and translate clinical needs/requirements into appropriate systems and application development; Project design and implementation, prioritize, organize, assess and relocate issues and respond quickly to customer needs; skills to lead meetings, prioritize, resolve conflicts; strong communication and follow-up skills. 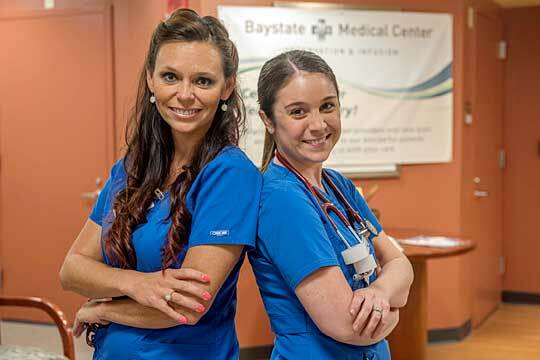 License: Current licensure in the state of Massachusetts as nurse or in a healthcare field. ANCC Clinical Informatics or HIMSS Certified Professional in Healthcare Information and Management Systems is required.